And besides, being 5’3 inches, I enjoy the perks of being a few inches taller for a day or evening. But more than this, I am an even a more obsessed kind of gal with the mission of finding the perfect neutral shade espadrille that I know I can wear with any outfit. Once a year, I take myself on a literal shoe hunt, sans any kind of weaponry (besides my wallet) to almost every shoe department to fulfill this need. And as luck would have it, I recently came across these Valentino wedges which are absolute perfection. The color is perfect as it more or less matches my own skin tone, thus giving the illusion of an elongated leg. And I can vouch that it is as comfortable as it is fashionable. 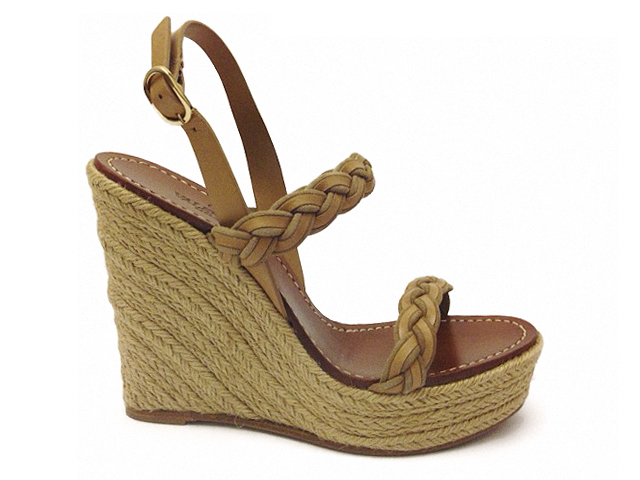 I have also included an image of another favorite espadrille wedge for resort by designer Tabitha Simmons. It is a blue multi textured peruvian silk with a cool tribal feel and a great way to add color to any outfit that needs a little pop of color. im an espadrille fanatic too!! love these gotta get! !